Looking for a faster, easier, more rewarding shopping experience?Save time and money with the Dillons app! It puts convenience,savings and rewards at your fingertips. Simply download the app,create an account and register your Dillons Shopper’s Card toaccess all these great benefits: - Shop Pickup or Delivery rightfrom the app! - Easily build your online shopping list, and use itto shop in-store or to place your online order. - View your WeeklyAds and quickly add sale items or specials to your shopping list. -Load digital coupons directly to your Shopper’s Card and use themto save on items from your shopping list. - Get even more savingswhen you choose items from our Smart Suggest feature. - Refill yourDillons Pharmacy prescriptions directly from your phone or tablet.Just type in your prescription number, select your Pharmacy andschedule a convenient pickup time. - Check your fuel points. - Useour locator to find the closest Dillons store or fuel center. -View your purchase history. Use it to create standard orders thatwill save you time. - Save BIG with exclusive promotions,personalized offers and bonus rewards. To use the Dillons app,you'll need a Dillons digital account. You can register for youraccount and link your Shopper’s Card through the app. If you don'thave a Shopper’s Card, you can create one when you register toaccess all of these savings and rewards! 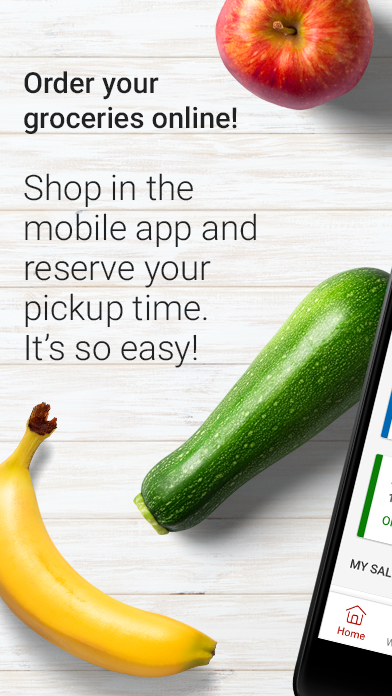 Looking for a faster, easier, more rewarding shopping experience?Save time and money with the Kroger app! It puts convenience,savings and rewards at your fingertips. Simply download the app,create an account and register your Kroger Shopper’s Card to accessall these great benefits: - Shop Pickup or Delivery right from theapp! - Easily build your online shopping list, and use it to shopin-store or to place your online order. - View your Weekly Ads andquickly add sale items or specials to your shopping list. - Loaddigital coupons directly to your Shopper’s Card and use them tosave on items from your shopping list. - Get even more savings whenyou choose items from our Smart Suggest feature. - Refill yourKroger Pharmacy prescriptions directly from your phone or tablet.Just type in your prescription number, select your Pharmacy andschedule a convenient pickup time. - Check your fuel points. - Useour locator to find the closest Kroger store or fuel center. - Viewyour purchase history. Use it to create standard orders that willsave you time. - Save BIG with exclusive promotions, personalizedoffers and bonus rewards. To use the Kroger app, you'll need aKroger digital account. You can register for your account and linkyour Shopper’s Card through the app. If you don't have a Shopper’sCard, you can create one when you register to access all of thesesavings and rewards! Looking for a faster, easier, more rewarding shopping experience?Save time and money with the Fry’s app! It puts convenience,savings and rewards at your fingertips. Simply download the app,create an account and register your Fry’s Shopper’s Card to accessall these great benefits: - Shop Pickup or Delivery right from theapp! - Easily build your online shopping list, and use it to shopin-store or to place your online order. - View your Weekly Ads andquickly add sale items or specials to your shopping list. - Loaddigital coupons directly to your Shopper’s Card and use them tosave on items from your shopping list. - Get even more savings whenyou choose items from our Smart Suggest feature. - Refill yourFry’s Pharmacy prescriptions directly from your phone or tablet.Just type in your prescription number, select your Pharmacy andschedule a convenient pickup time. - Check your fuel points. - Useour locator to find the closest Fry’s store or fuel center. - Viewyour purchase history. Use it to create standard orders that willsave you time. - Save BIG with exclusive promotions, personalizedoffers and bonus rewards. To use the Fry’s app, you'll need a Fry’sdigital account. You can register for your account and link yourShopper’s Card through the app. If you don't have a Shopper’s Card,you can create one when you register to access all of these savingsand rewards! Looking for a faster, easier, more rewarding shopping experience?Save time and money with the Fred Meyer app! It puts convenience,savings and rewards at your fingertips. Simply download the app,create an account and register your Fred Meyer Shopper’s Card toaccess all these great benefits: - Shop Pickup or Delivery rightfrom the app! - Easily build your online shopping list, and use itto shop in-store or to place your online order. - View your WeeklyAds and quickly add sale items or specials to your shopping list. -Load digital coupons directly to your Shopper’s Card and use themto save on items from your shopping list. - Get even more savingswhen you choose items from our Smart Suggest feature. - Refill yourFred Meyer Pharmacy prescriptions directly from your phone ortablet. Just type in your prescription number, select your Pharmacyand schedule a convenient pickup time. - Check your fuel points. -Use our locator to find the closest Fred Meyer store or fuelcenter. - View your purchase history. Use it to create standardorders that will save you time. - Save BIG with exclusivepromotions, personalized offers and bonus rewards. To use the FredMeyer app, you'll need a Fred Meyer digital account. You canregister for your account and link your Shopper’s Card through theapp. If you don't have a Shopper’s Card, you can create one whenyou register to access all of these savings and rewards! Looking for a faster, easier, more rewarding shopping experience?Save time and money with the Food 4 Less app! It puts convenience,savings and rewards at your fingertips. Simply download the app,create an account and register your Food 4 Less Shopper’s Card toaccess all these great benefits: - Shop Pickup or Delivery rightfrom the app! - Easily build your online shopping list, and use itto shop in-store or to place your online order. - View your WeeklyAds and quickly add sale items or specials to your shopping list. -Load digital coupons directly to your Shopper’s Card and use themto save on items from your shopping list. - Get even more savingswhen you choose items from our Smart Suggest feature. - Refill yourFood 4 Less Pharmacy prescriptions directly from your phone ortablet. Just type in your prescription number, select your Pharmacyand schedule a convenient pickup time. - Check your fuel points. -Use our locator to find the closest Food 4 Less store or fuelcenter. - View your purchase history. Use it to create standardorders that will save you time. - Save BIG with exclusivepromotions, personalized offers and bonus rewards. To use the Food4 Less app, you'll need a Food 4 Less digital account. You canregister for your account and link your Shopper’s Card through theapp. If you don't have a Shopper’s Card, you can create one whenyou register to access all of these savings and rewards! Looking for a faster, easier, more rewarding shopping experience?Save time and money with the QFC app! It puts convenience, savingsand rewards at your fingertips. Simply download the app, create anaccount and register your QFC Shopper’s Card to access all thesegreat benefits: - Shop Pickup or Delivery right from the app! -Easily build your online shopping list, and use it to shop in-storeor to place your online order. - View your Weekly Ads and quicklyadd sale items or specials to your shopping list. - Load digitalcoupons directly to your Shopper’s Card and use them to save onitems from your shopping list. - Get even more savings when youchoose items from our Smart Suggest feature. - Refill your QFCPharmacy prescriptions directly from your phone or tablet. Justtype in your prescription number, select your Pharmacy and schedulea convenient pickup time. - Check your fuel points. - Use ourlocator to find the closest QFC store or fuel center. - View yourpurchase history. Use it to create standard orders that will saveyou time. - Save BIG with exclusive promotions, personalized offersand bonus rewards. To use the QFC app, you'll need a QFC digitalaccount. You can register for your account and link your Shopper’sCard through the app. If you don't have a Shopper’s Card, you cancreate one when you register to access all of these savings andrewards! Looking for a faster, easier, more rewarding shopping experience?Save time and money with the Ralphs app! It puts convenience,savings and rewards at your fingertips. Simply download the app,create an account and register your Ralphs Shopper’s Card to accessall these great benefits: - Shop Pickup or Delivery right from theapp! - Easily build your online shopping list, and use it to shopin-store or to place your online order. - View your Weekly Ads andquickly add sale items or specials to your shopping list. - Loaddigital coupons directly to your Shopper’s Card and use them tosave on items from your shopping list. - Get even more savings whenyou choose items from our Smart Suggest feature. - Refill yourRalphs Pharmacy prescriptions directly from your phone or tablet.Just type in your prescription number, select your Pharmacy andschedule a convenient pickup time. - Check your fuel points. - Useour locator to find the closest Ralphs store or fuel center. - Viewyour purchase history. Use it to create standard orders that willsave you time. - Save BIG with exclusive promotions, personalizedoffers and bonus rewards. To use the Ralphs app, you'll need aRalphs digital account. You can register for your account and linkyour Shopper’s Card through the app. If you don't have a Shopper’sCard, you can create one when you register to access all of thesesavings and rewards! Looking for a faster, easier, more rewarding shopping experience?Save time and money with the King Soopers app! It puts convenience,savings and rewards at your fingertips. Simply download the app,create an account and register your King Soopers Shopper’s Card toaccess all these great benefits: - Shop Pickup or Delivery rightfrom the app! - Easily build your online shopping list, and use itto shop in-store or to place your online order. - View your WeeklyAds and quickly add sale items or specials to your shopping list. -Load digital coupons directly to your Shopper’s Card and use themto save on items from your shopping list. - Get even more savingswhen you choose items from our Smart Suggest feature. - Refill yourKing Soopers Pharmacy prescriptions directly from your phone ortablet. Just type in your prescription number, select your Pharmacyand schedule a convenient pickup time. - Check your fuel points. -Use our locator to find the closest King Soopers store or fuelcenter. - View your purchase history. Use it to create standardorders that will save you time. - Save BIG with exclusivepromotions, personalized offers and bonus rewards. To use the KingSoopers app, you'll need a King Soopers digital account. You canregister for your account and link your Shopper’s Card through theapp. If you don't have a Shopper’s Card, you can create one whenyou register to access all of these savings and rewards! Download to get many Discounts, Coupons Codes for Kroger. You canbrowse and save the Discounts and Coupons Codes for Kroger byadding to cart for later use. Get instant updates and start savingon your shopping immediately with Coupons for Kroger.You’ll besurprised how much savings you get. Please note that this is anindependent, unofficial app developed for your ease of use to savemoney for shopping with Coupons for Kroger. We appreciate yourfeedback on reviews and rating for improvement. Also, pleasecontact us feel free to contact us for any legal or rights concernswith this Coupons for Kroger. Let us help you make your shopping atColeseasier, simpler and faster with the new Coles app.Let it become your grocery shopping assistant. Throw awaythatpaper and pen and embrace the change on digitising yourgroceryshopping list.So what's so good about it?• Personalise your experience: Link your flybuys membernumberand have your household flybuys card, points balance, offersandbought before history in one place• Build your list in under a minute: Create your listbyaccessing your bought before shopping history• Save money: We will let you know when your favouriteproductsgo on Special by simply adding them to your Watch List• A smarter shopping list: Navigate around your storequickerwith a shopping list that sorts products by aisle• Recipes: Let us inspire you with new recipe ideas which canbeeasily straight into your shopping list• Store details: Find everything you need to know aboutyourColes store, address, phone and trading hours• A slick new interface: Our new design is simple, easyandintuitive to useSo what are you waiting for? Download the new Coles app andstartenjoying your grocery shopping assistant.